Sligo winger, Daniel Kearns' was twice a target of Kenny Shiels this season. DERRY CITY boss Kenny Shiels has revealed that he has been TWICE priced out of signing exciting winger, Daniels Kearns, by both Glenavon and Sligo Rovers this season. Belfast man Kearns (24) was a former trainee at West Ham United and spent three seasons at Peterborough United before signing for Carlisle United in 2014. The tricky winger then returned to N. Ireland where he signed for Glenavon last October, helping the Lurgan Blues to an Irish Cup success. Shiels, who worked with Kearns during his time as the N. Ireland U17s coach, made attempts to sign the ex-Dundalk man during his spell with Glenavon but wasn’t able to compete financially with the Mourneview Park outfit in terms of wage demands. When Kearns’ contract expired this summer, Shiels once again made an approach to sign the player but, for a second time, was outpriced - this time by sixth placed, Sligo Rovers. 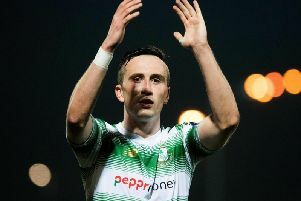 The Belfast man signed for the ‘Bit O’Red’ on July 9th last as he returned to the League of Ireland for a second spell. Having opted out of signing former fans’ favourite, Paddy McCourt, this month, the news that Kearns slipped through the net won’t go down well with the ‘Candy Stripes’ faithful. “Sligo have Daniel Kearns who we couldn’t afford,” said Shiels last night. “We couldn’t get anywhere near him. We made two attempts to sign him this season. He played for me as a No. 10 but we couldn’t meet Glenavon’s wages and we couldn’t meet Sligo’s either.